Vacation in June or first week of July and avoid the Lodging Tax! 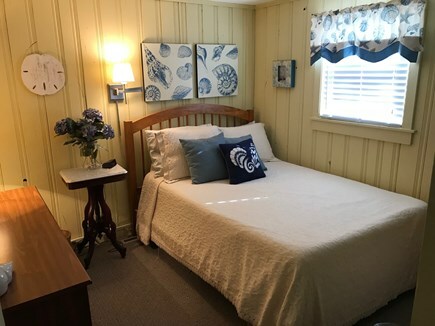 This year round home is located in a quiet, residential area and is close to many restaurants, shopping, golf, ferries, bike paths, parasailing, jet ski rentals, stand up paddleboarding, kayaking, mini-golf, batting cages, go-karts, and much more. South Middle Beach and Smuggler’s Beach are only a 4/10 mile walk! 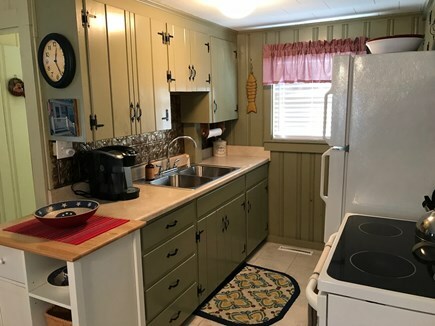 Kitchen has electric stove, toaster oven, refrigerator, Kuerig coffee maker, microwave, pots & pans, dishes along with utensils. 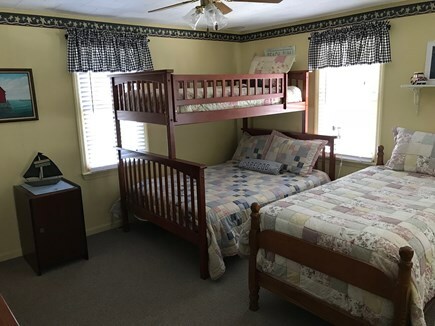 Two bedrooms, one with full bed and one with full bed, bunk twin, and separate twin. Three season porch is awesome for summer night relaxing. Cable TV on porch and in living room with DVD/CD player. Ceiling fans and bedroom window air-conditioning provided. High speed WIFI is provided. 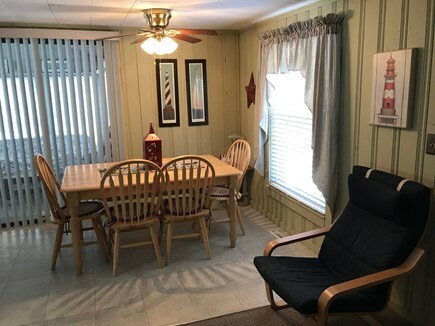 Outside has large deck, BBQ grill, picnic table, and large clean outside shower. This house and area are perfect for family vacations. Linens and kitchen towels are provided. Tenants supply own bath towels and beach towels. No pets or smoking please. Additional pricing info: Discount available for multiple week rentals, State and local taxes of 14.45% will apply. Our family had a great time on Cape Cod! Thanks to Ray and Camille, our stay in their cottage was very enjoyable! Their cottage has all the comforts of home. The house is supplied with everything you could possibly need, especially the kitchen. We have just returned home from an amazing week on the Cape. This home owned by Ray & Camille was the absolute perfect place to stay. So close to the beach, so cozy and just all around fantastic. The patio and outdoor shower are gorgeous. I don’t think our children used the indoor shower once ! We can’t say enough about this rental. Clean as a whistle and plenty of room for our family of 4. The house has everything you can possibly need , beach items to use and also everything you need to cook meals there. 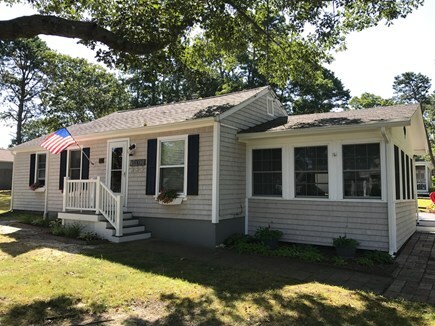 We have being visiting the Cape for the past 14 years, and this home was our favorite among many homes we've stayed in. Ray and Camille's home exceeded our expectations. They have made a very comfortable home for their guests. The house was spotless and very cozy. 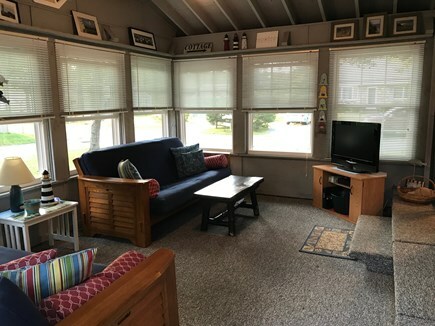 The kitchen was fully stocked, the beds were so comfortable, and the sunroom is a great addition and comfortable space for the family to hang out in. The outdoor set up was lovely and very accommodating. 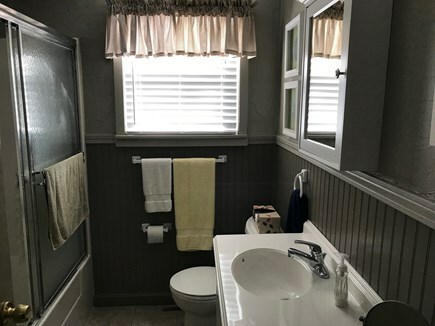 There is also one and a half baths which is not mentioned in the description but is a great addition. The beach is walking distance and is a very beautiful beach. 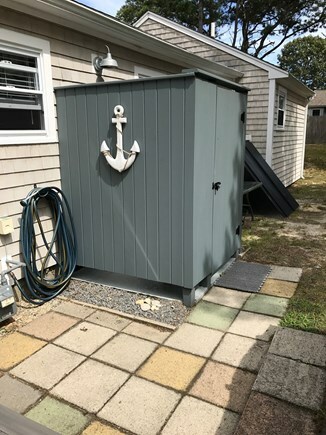 Our favorite feature of the house was the outdoor shower which was great for when we came home from the beach. 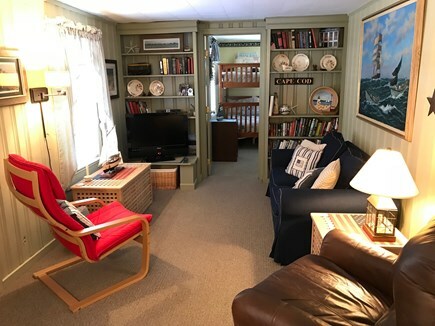 Spacious and comfortable in a quiet area! We really enjoyed our stay. The house is great! It is comfortable, clean and well maintained. It had plenty of space for our family of 6. It is located in a quiet neighborhood, close to attractions and a short walk to the beach. We had a wonderful vacation at this house and would definitely rent again. Thank you, Ray and Camille, for letting us stay at your home. This house has been in our family for about 60 years and has been our family vacation house. We now live full time 15 minutes from this property so this is the first year that we will be renting this house. We are available by phone, text, or email to our tenants. 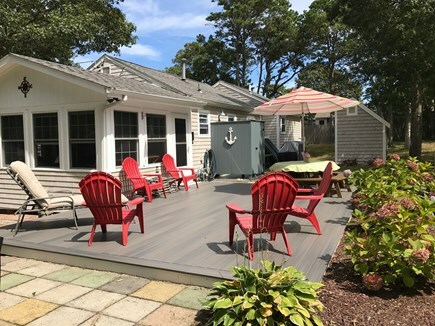 The three season porch, outside deck, and outside shower are awesome features for a family vacation. The large yard allows ample room for outdoor yard games and room to park a boat or jet skis. The home is very clean and in excellent repair. This neighborhood is very quite and family oriented. 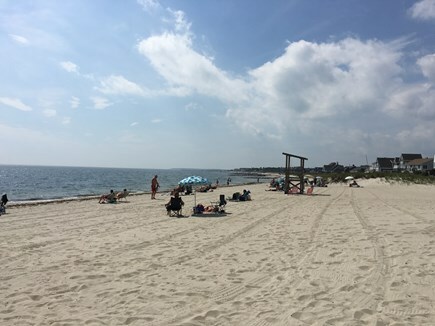 South Yarmouth is centrally located on Cape Cod. It is close to south side beaches, shopping, mini-golf, restaurants, water sports, and much more. There is easy access Rt. 28 and to all parts of the Cape including ferries to Martha's Vineyard and Nantucket. The Cape Cod Rail Trail goes through Yarmouth and spans 22 miles of trails for biking, walking, running, or rollerblading.